One of the first efforts to deal with housing anxieties was designed by the previous provincial administration. In August 2016, when the BC Liberal government implemented a 15% surtax on foreign homebuyers in Metro Vancouver, the reaction from residents was overwhelmingly positive. Still, popularity came with a caveat. A survey I conducted in September 2016 showed that 76% of British Columbians supported the foreign-buyer’s tax, but two thirds (68%) thought the policy would be “unsuccessful” in making it easier for British Columbians to own a home. Yes, it is possible to like what a government is doing and still think it will be futile. A more controversial discussion emerged over what is sometimes referred to as the “additional school tax.” The introduction of a tax of 0.2% on the value of homes worth between $3 million and $4 million, and a tax rate of 0.4% on the portion of a home’s value that exceeds $4 million, was deemed a “very good” or “good” idea by 67% of British Columbians in May. 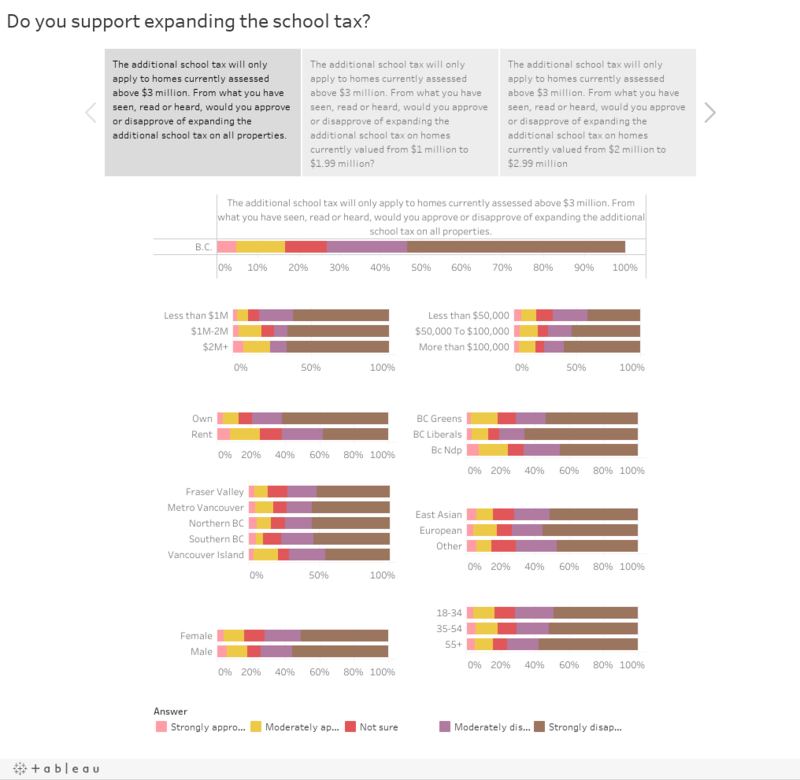 In September, Research Co. asked, on behalf of StepUp BC, about the possibility of the “additional school tax” being expanded. 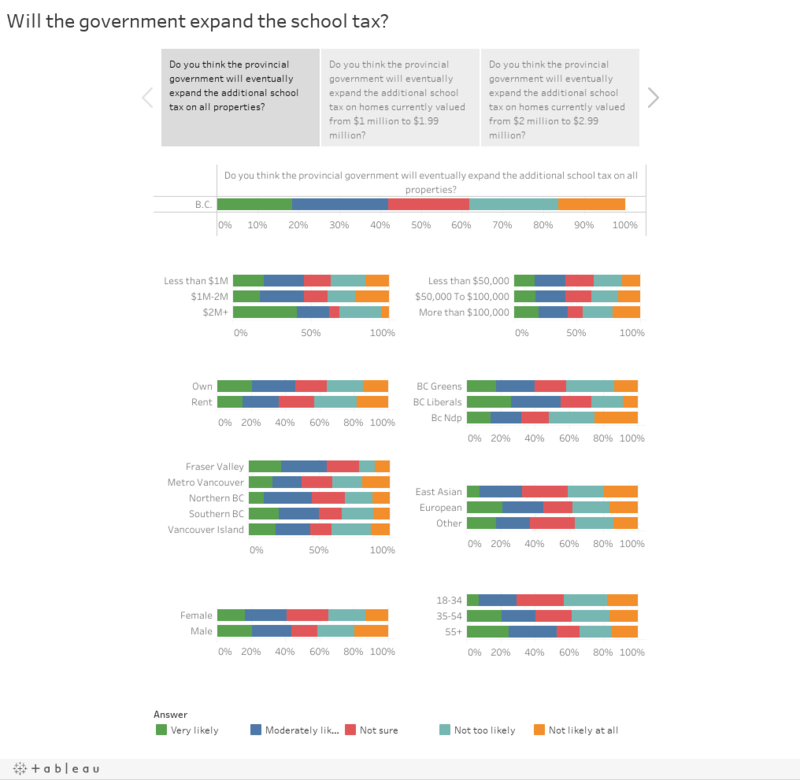 The survey found that 70% of British Columbians think the provincial government will likely expand the additional school tax to properties valued from $2 million to $2.99 million. Three-in-five British Columbians (61%) said they would approve of that degree of expansion. However, there is a big difference in the way those who reside in a property currently assessed at $2 million or more feel about this expansion: two thirds of these homeowners (66%) disapprove of the policy. The additional school tax is unusual. Many homeowners fear that their property could be next in line, if an expansion is contemplated down the road. 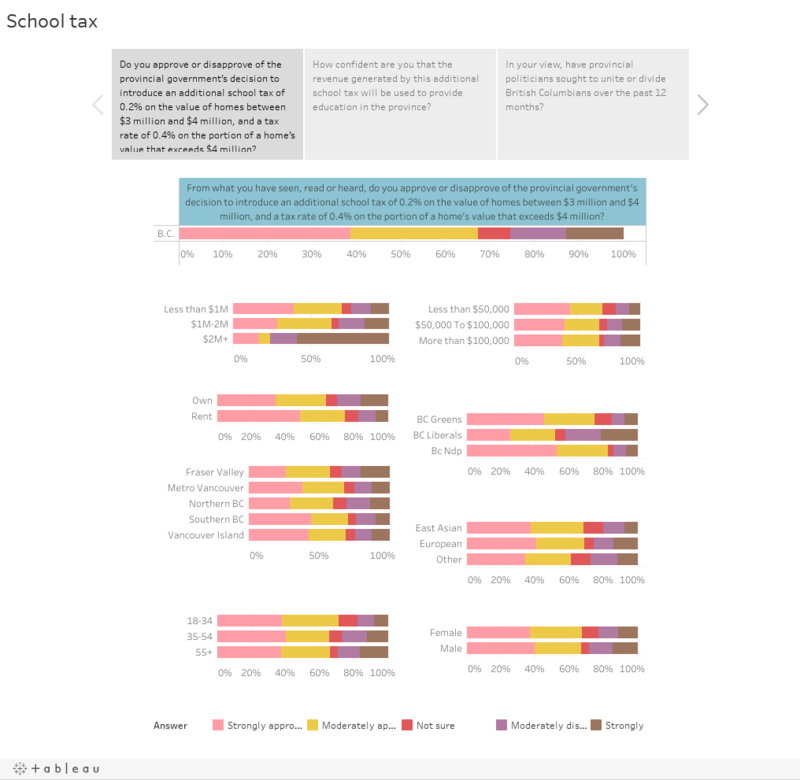 Another issue that will challenge perceptions is that 57% of British Columbians are not confident that the revenue generated by the additional school tax will actually be used to provide education in the province – a gentle reminder that a policy can be popular and lead to skepticism at the same time.